In this day and age, when art of numerous kinds is increasingly being disseminated by electronic means, it is of critical importance to pay attention to the underlying technology and its inherent limitations. This especially in view of the fact that the "digital representation" of a work of art — be it a painting, a musical composition or a film — may very well be the only representation easily accessible to a given listener or spectator, whether Fine Arts student or fanboy. The idea for this article on the topic of PAL Speedup was born when I received the following message from my robert-bresson.com co-admin Doug Cummings who had just received his New Yorker A Man Escaped DVD: "I've just watched the first five minutes and I swear I can notice a slightly higher pitch/pace to everything. Could 4% actually be noticeable or am I just hypersensitive now?" Doug prepared the below audio samples from his old New Yorker VHS tape. Jan Bielawski, Nick Wrigley, and Ted Todorov also contributed to this report. Content is © 2004 mastersofcinema.org. Movies are projected in the theatre at the well-known rate of 24 film frames per second. The PAL TV system (used in Europe, Australia and other places) projects images at a rate of 25 film frames per second. A problem thus arises when attempting to transfer a movie (24 fps) to PAL video (25 fps). The way this is normally done is to simply display 25 images from the film every second. That is, 25 frames from the film are being shown during a time interval within which 24 frames were supposed to be shown. The film is thus being projected 4% faster than intended by the director (25/24 = 1.04). The most obvious effect of this speedup is that the film as viewed on PAL video (VHS or DVD) has a running time 4% shorter than it had when projected in the theatre, and 4 % shorter than what is specified in the Internet Movie Database. Take as a not-so-random example Béla Tarr's spectacular Sátántangó, a 450 minute film. A hypothetical future release by a European company would produce a DVD that is a mere 431 minutes — almost 20 minutes too short. Great if you are in a hurry, but most of us would probably feel ripped off. Let us hope that a future North American release is not based on a PAL master. There is another effect associated with this speedup, an effect that is especially obvious to those with a well-developed musical ear: viz., the audio track of the film is playing 4% too fast, and thus 4% higher in pitch. From music theory we recall that one semitone in equal temperament is exactly 1/12 of the octave, i.e., 1/12 of doubling the frequency, i.e., the 12th root of 2, which is 2^(1/12) = 1.06, a result that is very close to the PAL speedup (1.04). In musical terms, PAL speedup therefore corresponds to a rise in pitch of a bit less than one semitone (or, 0.706724268642822855 semitones, to be precise). 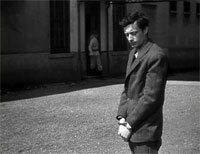 Let us turn our attention to Robert Bresson's A Man Escaped [R1/NTSC DVD, New Yorker Video, May 2004], an unfortunate victim of PAL speedup. There exists no valid excuse for subjecting an NTSC DVD to PAL speedup. PAL speedup is out of line and entirely avoidable, as already pointed out in our review of the DVD. It is especially egregious when a classic of film history, continually under analysis by students and scholars, is subjected to such irresponsible treatment. This problem is not limited to New Yorker Video. The main focus of this brief report is on the change in pitch of the audio track of a film we dearly love. It is not our intention to condemn native PAL as a video format, but rather to question the use of PAL masters for NTSC DVD releases. The associated problem of "ghosting" will not be touched upon, as this has been adequately addressed elsewhere. We will compare audio samples taken from the recent (May 2004) New Yorker DVD to audio samples taken from the old New Yorker VHS tape. The DVD suffers from PAL speedup, as we have already established. The VHS tape does not suffer from PAL speedup, as it was not mastered from a PAL source. Just how noticeable is the speedup? We're about to find out. The following matrix contains three audio samples (in mp3 format) excerpted from A Man Escaped. The first column contains three samples taken from the VHS, the second column has the corresponding audio clips from the DVD (suffering from speedup), and the third column has the previous VHS and DVD audio samples stacked back-to-back to ease comparison. Concentrate on pitch, and ignore the slight differences in volume and audio quality; the sonic quality the VHS audio track, with its hiss, is of course inferior to that of the DVD. The above comparison speaks for itself — the semitone shift in pitch is very noticeable indeed. Many Bressonians are intimately familiar with the film from seeing it repeatedly in the theatre, and will immediately spot the 4% speedup on the DVD (case in point: Doug, as referred to in the article's introduction). The rest of us will readily agree that the shift is quite significant once we're presented with the "stacked" clips in the right hand side column above. The "tram bells" audio clips contain some very distinct frequency components and lend themselves especially well to a numerical analysis, thus providing us with hard facts rather than mere subjective impressions that may depend on how well-trained one's ear is (or is not). 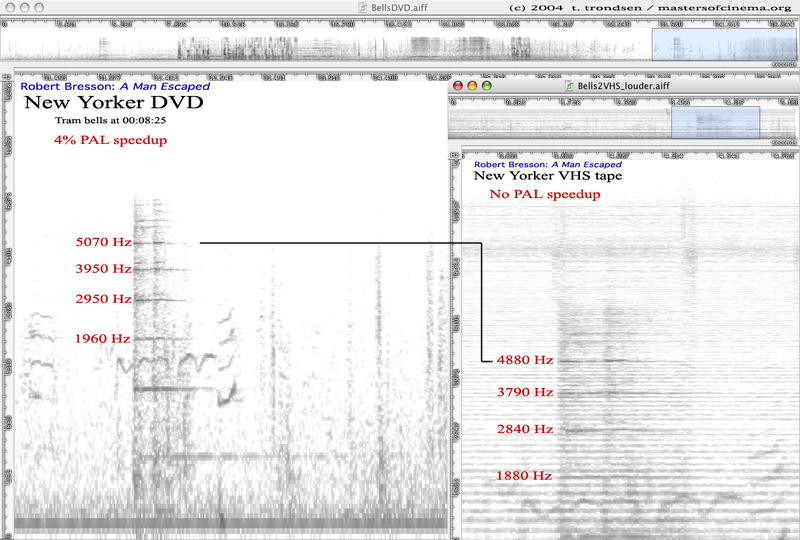 The following figure (click to enlarge) shows the sonogram (Fourier spectrum) of the tram "ding-ding!" of the DVD on the left and that of the VHS on the right. We have roughly measured and labelled four discrete frequency components (red labels). 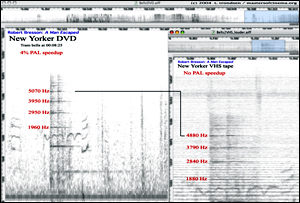 Comparing the labelled frequency components of the DVD spectrum to the corresponding components in the VHS spectrum on the right clearly shows an approximately 4% frequency shift. It should be mentioned that the audio pitch of some PAL transfers made today is deliberately being lowered back down to its original 24 fps equivalent. Such pitch shifting is done by employing sophisticated digital signal processing (DSP) techniques. These techniques can only generate an (albeit sometimes fairly good) approximation of the original signal. Unfortunately, in the process they also introduce a certain amount of "smearing" into the sonic landscape. (One might argue that two wrongs don't make a right, and that such manipulation of the sped-up audio actually should be avoided altogether.) PAL users will however still have to live with image speedup (and thus short running times) until the new version of the DVD-Video Specification is approved and High Definition DVD (HDDVD) is on the market. The new players will be backward-compatible with the existing DVD inventory, but older players obviously will not play HDDVD. Note that PAL is (visually speaking) most definitely the superior format in that it has significantly higher resolution than NTSC, and most modern PAL TVs have a much higher internal refresh rate (100 Hz, as opposed to 60 Hz for NTSC TVs). PARTING THOUGHTS: We know of no other art form to which such "systematic" defacing is applied without it immediately being addressed and rectificed to within the levels of precision afforded by available technology. PAL speedup is needlessly inflicted upon NTSC material and this is widely accepted as a "fact of life." Is this acceptable, in view of the fact that a proper NTSC master could easily be produced? If money is the only obstacle, why not surrender the rights of a given title to someone who can afford to give it the treatment it really deserves? Article_v.1.1 – May 29, 2004.